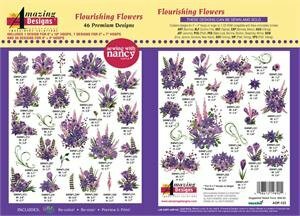 Embellish projects with the realistic Flourishing Flowers collection by Sewing With Nancy. These exquisite, multi-colored embroidery designs are the perfect addition to spring table runners, towels, pillows and other home décor. They also are a great way to add texture to any landscape quilt! Dimensions: 38 designs fit a 4x4 inch hoops, 7 designs fit 5x7 inch hoops, and 1 design for a 6x10 inch. and following embroidery machine brands: Brother, BabyLock, Singer, Husqvarna Viking, Bernina, Janome, Pfaff, Tajima, Toyota, Melco, Happy Elna, Simplicity, New Home, White, Kenmore, and others.